What's Your Spin On Hanukkah? What's Your Spin On Hunukkah? What’s Your Spin on Hanukkah? Live from the Clergy Suite, the clergy discuss one of the original intersections of tradition and innovation: the holiday of Hanukkah. Rabbis Klein Miles, Nickerson, Frimmer and Cantor Coyot discuss the historical narrative of war (the Maccabees and the Seleucid army) followed by a rabbinic reinvention focusing on faith and light. How does these stories shape our practices today? In what ways are we adding our own innovations to this beloved tradition? How might your Hanukkah celebration look different this year? 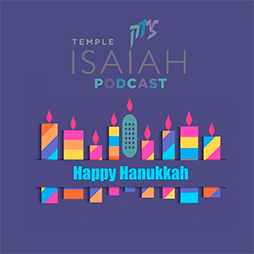 Links for items talked about in the show: Hanukkah resources: goo.gl/MgsNQC from Cantor Coyot. Conversation with Cantor Tifani Coyot and Cantorial Soloist Rabbi Jaclyn Cohen moderated by Rabbi Joel Nickerson. 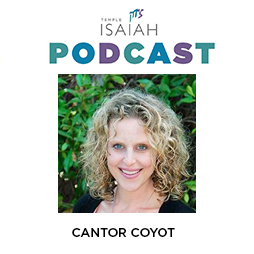 At Temple Isaiah the cantorial department oversees and helps the rest of the clergy and staff create the vision around Music, Ritual, Spirituality and Prayer. How does being a mother/parent influence the way we craft the ritual, music and prayer at Isaiah? How has your understanding of ritual and prayer influenced your parenting? What music and rituals happen in your home? Why that piece of music? Do your sons and husbands have a favorite Jewish song? For those of us who are not musicians or clergy…what strategies would you recommend for them to add to their parenting? EXTENDED VERSION - Catastrophe Parenting deals with parents who get emotional or anxious in almost every situation so that every event is one level of catastrophe or another. We will learn how to climb down from that ladder. The question and answer section of the conversation starts at 36:18 mark. 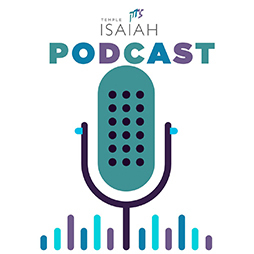 Rob, Dara and Joel exchange thoughts on how to live a life of faith, purpose and meaning in the 21st century. This conversation was part of our Installation weekend celebration Rob Bell is an American author, speaker and former pastor. Bell was the founder of Mars Hill Bible Church located in Grandville, Michigan, which he pastored until 2012. He is also the author of the New York Times bestseller Love Wins and the writer and narrator of a series of spiritual short films called NOOMA. In 2011, Time Magazine named Bell on its list of the 100 Most Influential People in the World. He has since become a freelance writer and speaker appearing on various talk shows and national speaking tours on topics related to spirituality and leadership. He also hosts a popular podcast called,'The Robcast. : robbell.podbean.com/' In 2018, a documentary about Bell called "The Heretic" was released. We were honored to have Rob as our special guest for our Installation weekend.